The Fordingbridge Twinning Association has been very busy lately: a group of 17 visitors went to the annual “Foire de la Pomme” (Apple Fayre) in October and were warmly welcomed by friends from France, Belgium and Germany, including a presentation to the local head of Twinning in Vimoutiers. A special welcome was given to Tim Wheatley and Dave Green who had cycled by tandem, from Le Havre, the same route undertaken by Tim’s father, 35 years ago, when the Association was first formed. 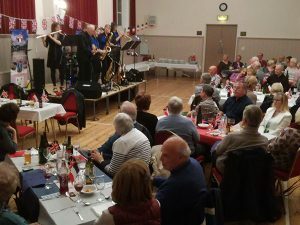 The annual evening of music, now in its fifth year, was a great success again, this time featuring local band “Blue Tides”, in Fordingbridge Town Hall. This proved to be even more popular than usual, so much so, that the band has been booked again for next year’s evening of music, on Saturday 27th October 2018. The next Twinning event will be on Saturday evening 3rd February, the annual “Murder Mystery Evening”. Tickets will be on sale in the new year.